A conversation on Facebook this morning started me thinking about regeneration and space. Today saw the launch of the consultation period for Ten Streets, a development proposal to take a run down and underused pocket on the North Docks in Liverpool and turn it into something else. The video below gives you an idea where they’re going. We’re adding something new and different to around 125 acres of Liverpool’s Northern City Fringe – a vibrant creative quarter located within the Liverpool City Enterprise Zone that will drive future prosperity and enhance the city’s status as an international destination with a unique offer and character. Now, we’ve all been here before. In fact, we’re all there now essentially. 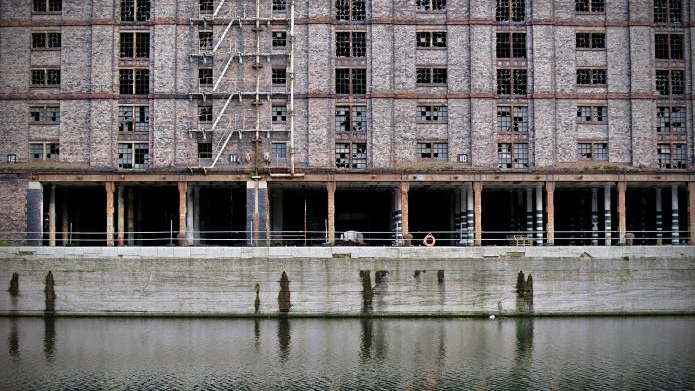 This project will sit alongside the Peel Developments Liverpool Waters project, one that envisions a glowing row of towers housing offices and flats that will transform the city and in all likelihood kill off its World Heritage Site listing. Now, Liverpool Waters is a 30 year, five and a half billion pound projected plan with what looks like a five aside pitch in the middle of a dock. Ten Streets doesn’t go into that level of detail but there is talk of thousands of jobs, a revitalised economy and shared business and creative spaces for new ideas. I’ve included their ten images at the bottom of this post too so you can have a nosy. Has anyone ever delivered a renewal plan that didn’t see the world like that? The Ten Streets project team is made of the Council, AWP Architects and Harcourt Developments. Harcourt have form in this kind of project, they have been central to the Titanic Quarter regeneration in Belfast. As I see it the Titanic Quarter project hasn’t been all bad, it has managed to create jobs, bring in a college, add a few hundred homes (tiny as they may be) and hold onto the sense of the place, the dry docks and pump house that launched the Titanic survive and are a popular tourist spot. Titanic Belfast has won awards, the addition of the SS Nomadic has been a beautiful thing and has created a unique space, T13 does some pretty amazing stuff in urban sports and events and the Titanic Drawing Offices remain intact. (Apart from the bits we managed to kill off with MTV). With permission for more hotels, a sports facility and a load more living space it could really work. There is also the small matter of The Game of Thrones which is filmed in the ever-expanding Paint Hall Studios that is providing jobs and a year round creative force. My concern is that in the rush to redevelop I’m not sure Liverpool has the right approach. The Council has form but in a slightly different way, the City is becoming one big student village, I half expect to see Student Wardens patrolling Bold Street looking for nefarious behaviour. There are a dozen examples of woeful decisions. The loss of The Futurist Cinema is a prime example, such a waste, to build more student flats. The decision to allow the old Cork Merchants off Anne Street to be demolished for more student flats only adds to the sense the no one cares about the built heritage. There isn’t week that passes that doesn’t see the Echo list what is being lost. The new Chinatown project is quite possibly one of the ugliest, most inappropriate schemes I’ve ever seen. It looks like an oversized glass bully that has been dropped from the sky and will jut against two communities that seem to be getting slowly squeezed out. Just look at it. Hideous. Its has no connection to the surrounding community, no recognition of what is near it and it is identical to every other failed regeneration scheme. There is nothing innovative, nothing new, nothing to sing about. The redevelopment of Wolstenholme square with the Loss of The Kazimier and Cream was a horrible blow. The square will now house another raft of shoe box sides apartments and not much else. The suggestion that Cream will reappear as if by magic in the basement of one of the buildings is simply farcical. I haven’t heard anyone say it yet but I would be fairly certain that Kaz Gardens will be given a death sentence just after the apartments open. Their time is limited so visit soon. The Butler Building on Hope Street is perhaps one of the greatest crimes that has been committed in the city in the time we have been here. I remember it as a car park. Hell, I miss the car park. What they have created is a plasterboard disaster, stuck on bricks, cheap frontage and what appears to be a load of plumbing in need to repair. I say that as there are numerous bits of this thing bubbling up and falling off. As it is sat across from the Philharmonic Hall, the Philharmonic Pub and the Old Blind School you would have expected something of quality. This thing amounts to a prefab 60’s nightmare on speed. I’m going to be frank, that statue looks like someone left it there until they get the van. The one thing that should be alarming to us all is the threat to existing businesses and event spaces from their new neighbours. Take 24 Kitchen Street. They are slap bang in the middle of the Baltic Triangle, an organic area where artists and creators have set up home. They have a licence that runs through to 4am. They deliver superb nights, club events, live bands and they are in the middle of the numerous festivals that take place in the Baltic Triangle. Songbird Developments have been granted planning permission to build 200 flats next door. How long do you think they will last? Do you think the Developer will spend money soundproofing his building? I don’t think so. Bye Bye 24 Kitchen Street. Hello bland. The folks over at Baltic Creative are taking on a new building in Northern Lights, creating yet more space for creatives, room for imagination and performance, can Ten Streets do the same or will this be another set of hobbled together sticky back brick blocks? Only time will tell. But please Liverpool, no more Giants.